To reduce the deficit, the President suggests we increase taxes for the 430,000 Americans who have incomes above $1 million. The Republican leadership (Boehner, Ryan, McConnell and Graham) say that’s class warfare. They say it’s unfair to balance the budget at the expense of these few rich people (0.3% of the population). Instead, they say, we should look to reduce spending – only. In particular, we should cut Medicaid and Medicare. 47 million older and disabled Americans are enrolled in Medicare. 58 million poor children, pregnant women, older and disabled people are enrolled in Medicaid. Query: Why is it class warfare to tax a little more the few of us who are lucky enough to be millionaires, but it’s not class warfare to cut health care coverage for the vast number of us who are enrolled in Medicare and Medicaid? Discuss. Medicare has received most of the headlines regarding proposals from Congress and the Administration to reduce the federal deficit and raise the federal debt ceiling. Proposals to restructure Medicaid have been receiving less attention than those about Medicare. But Medicaid, which serves nearly 60 million Americans − older people, people with disabilities, pregnant women, children and their families – may be in greater jeopardy than Medicare. The good news is that more than 50% of all Americans either have received services through Medicaid or have a friend or family member who has, so most Americans know something about Medicaid and its importance to them, their families and friends. Nearly nine million low-income Medicare beneficiaries depend on Medicaid to help them pay Medicare’s significant premiums and cost-sharing and to pay for services erroneously denied or excluded from Medicare coverage, including nursing home care and community-based long-term supports and services. These beneficiaries are generally poorer and sicker than the general Medicare population. They comprise 21% of Medicare enrollees, and use 36% of Medicare dollars. They comprise 15% of Medicaid enrollees and use 40% of Medicaid dollars. Medicaid is critical to the health and well-being of these individuals and their families. Medicare’s Out-of-Pocket Costs –Medicaid pays for all of Medicare’s cost-sharing for about four million Medicare beneficiaries and pays the Part B premium for more than eight million beneficiaries. Long-Term Care Supports and Services – More than 10 million people in the U.S. have long-term care needs and more than 80% of those people live in the community. Medicare pays for only about one-quarter of spending for long-term care. When family resources are exhausted or in need of additional support, Medicaid steps in. Nursing Facility Services –Medicaid pays some costs for 70% of all nursing home residents, most of whom are also eligible for Medicare. Home and Community-Based Services – Increasingly, Medicaid is paying for long-term care supports and services in the community in addition to paying for care in nursing facilities. 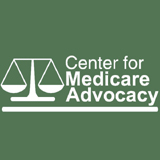 The Center for Medicare Advocacy represents thousands of dually eligible people who need help paying their Medicare cost-sharing or who have been denied Medicare coverage. These older and disabled people would go without necessary health care if they did not have Medicaid to help pay their Medicare out-of-pocket costs or to rely on when Medicare denies coverage – often erroneously. Although our clients may eventually win coverage on appeal, the vast majority of dually eligible people lack representation, and do not appeal Medicare denials. They depend on Medicaid to pay for necessary health care. The ability to fall back on Medicaid when Medicare coverage is denied, or is no longer available, or does not cover the needed health service, is also a blessing for families. Without Medicaid, families of these older and disabled people would have to find the resources themselves to pay for their loved-ones’ care, see them go without the care they need, or try to provide it themselves. Medicaid matters. Protect it – for the health of all Americans.